Three things are constant in my house… Music. Being active. And grilling. Despite living in the Northeast where it gets to be negative-two million degrees outside in the dead of winter and snow falls in feet, not inches — I grill year round. I can’t help but chuckle when photos pop up on Twitter or Facebook about “The first meal on the grill this year!” photos. Something about food on the grill keeps me putting on my winter jacket, hat, gloves and sometimes snowboard pants just to cook dinner. Winter time grilling is usually pretty… plain. It’s throw a slab of meat on there, a hunk of chicken or a pork chop. Maybe grill some potatoes or get creative with some shish-kabobs. Spring, Summer and Fall on the other hand, 95% of my dinner meal is cooked on the grill. Just like the chicken I eat with my meals during the week is grilled. The only thing that still finds its way to the stove is pasta. Veggies are amazing on the grill. Their flavors really tend to come out more when you wrap ’em up in tinfoil and toss ’em on for a few minutes on a medium heat. My favorites are tomatoes, onions and of course corn. Together, with some Italian seasoning, a little olive oil, it’s mouthwatering heaven. I’ll do this and add to it some orzo that I’ve boiled in vanilla water and eat it all week long because I tend to make too much when I cook. One key thing to remember is — Freshness. You want everything to be as fresh as it can be. Organic is better too if you can swing it. But if not, that’s okay too. It’s all a preference. To start, you’ll want to cook the orzo first, but instead of just plain water and pasta boiling on your stove until it’s done, you’ll want to add the vanilla into your water (stir it all in good). 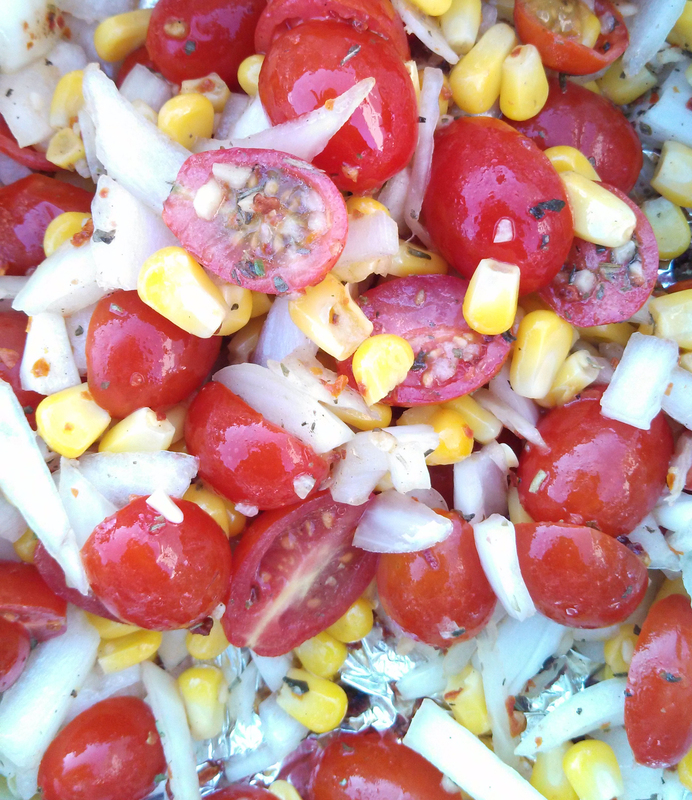 While that’s cooking, halve your tomatoes, chop your onions, then add them into a bowl with your corn and Italian seasonings. Once everything is mixed and blended well, place contents in the center of a piece of tinfoil. Fold the foil up and around the veggies, before sealing, pour the EVOO inside. Seal tightly and shake to coat everything with the EVOO. Open one small section of the foil before placing it on the grill. Cook on medium heat for about 15 minutes, just enough to turn the onions a little limp and char up the tomatoes a little. Once that is done, drain orzo and mix with veggies. Serve cold or warm.